Going forward, there are – and will continue to be – three primary drivers of global physical gold (and silver) demand. During certain times in the past only one or two of these elements provided most of the momentum. However, as we move into 2019, and for possibly the next 5-10 years, all three will be in play. They will operate synergistically to consistently motivate increased precious metals’ buying around the globe. This will happen, even as meeting that demand with sufficient new supply becomes problematic. Fear: Not just about social and economic unrest, but also – as prices begin to move up and away – fear of missing out! People buy gold (and silver) as insurance, as an easily saleable for cash when needed option, and as a last ditch “get out of Dodge” ticket when the local currency has been “burned” due to government mismanagement and corruption. Ask Vietnamese in the 1970’s or Zimbabweans, now in their second currency-destroying hyperinflation in recent memory. Ask Argentines facing their 9th currency-extinction event in modern history, or Venezuelans today. Fear manifests itself today in the current roller-coaster ride of the larger stock markets (DOW/S&P, etc. ), the student debt trigger (at almost $1.5t, much of which is in arrears), liquidity draining by the Federal Reserve, and record levels of overall U.S. debt. 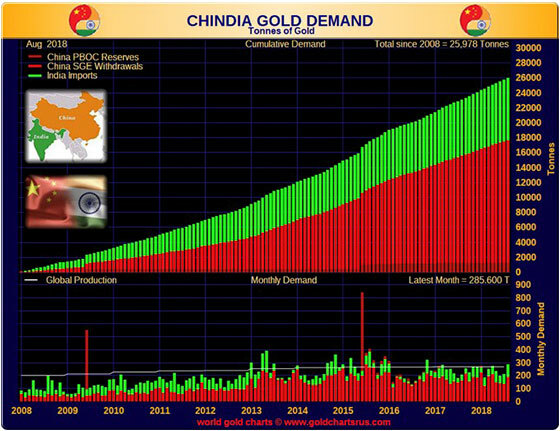 Love: The Chinese New Year celebrations are coming into view… Gold demand from China and India (Chindia) has been consistently higher for the last decade – with no signs of tapering. This is taking place because history and custom pretty much ordain it. With incomes rising in both countries, this solidly entrenched demand trend is set to continue for the foreseeable future. Inflation: For a number of years, an inflation vs. deflation debate has raged. Deflationary analysts believe that the coming massive debt repudiation, at some point inevitably taking place as the misguided, unpaid-for-spending is unwound, will take asset prices – including precious metals – down with it. But this perspective fails to consider that central banks – foremost among them the Federal Reserve (simply a central bank by another name) will absolutely do everything in their power to avoid an asset crash. Fed policymakers will print, literally and digitally, “as much as it takes” to keep this from happening. They want and need inflation to keep their game going as long as possible. Not to mention that the government’s massive deficits get paid off in worth-less money. Politicians can continue spending paper promises, get re-elected, and reward their political allies. When a financial crisis is related to the private sector, it generally takes a deflationary form. When it relates to the government, it generally takes an inflationary form. The next super-crisis in the West is vastly more likely to be a government crisis, not a private sector crisis, and the place that crisis is most likely to take place in is… America. The trend, if going against you, becomes your enemy. 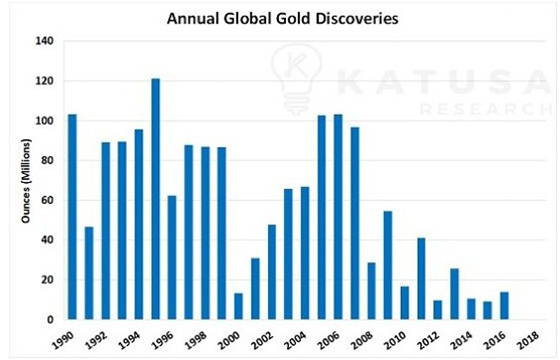 In spite of increased exploratory spending, new large gold discoveries are becoming less common, more costly to find, and taking increasingly longer to develop to production stage when they are located. The discovery trend for large gold deposits is decidedly down. Silver production, marching to its own supply drummer, is not looking all that robust either. At current mining rates, only about 9 ounces of silver are being mined for every mined ounce of gold. Yet the silver gold ratio is running around 85:1. Is something seriously out of whack? Seven years after a major, but most likely not the major top in gold prices at around $1,900 the ounce, gold still shines brightly in the protect your assets department. Liquid, easily storable, fungible, easily divisible, and historically reliable. 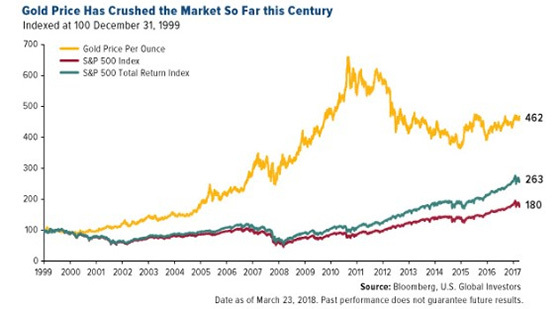 Over 20 years, Gold has outpaced stocks… and inflation. In 2001, at the tail end of a 20-year silver bear market, Doug Casey said: At the top, people don’t look at fundamentals because they think they’re no longer relevant… At the bottom, they’re not looking because they just don’t care. What have the global ‘financial wizards’ learned since 2008? In 2008, global debt totals were in the area of $170 trillion, to the tune of 275% of the world’s gross domestic product (GDP). Today those figures are above $250 trillion and well over 300% of GDP. Look at how little the world’s financial wizards seemed to have learned from the crises which literally came within hours of taking the entire global financial system down with it.